Since it's conception over 35 years ago, the Hansen Easy Fit Pipe Fittings range has developed into an internationally recognised pipe fitting known well for for it's ease of use, simplicity and proven long term reliability. Smart design, high quality materials and staying in touch with customers needs has allowed this range to evolve over the years to meet customers specific needs, and continues to grow with the addition of the new Compression fittings range. 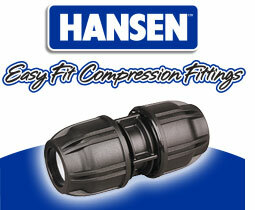 Hansen introduces the new Compression Fittings range designed specifically for joining Medium Density polyethylene pipe. Building on 50 years experience in the manufacturing of pipe fittings and valves, the sleek, precision, compact design uses only the very best materials to withstand the harshest weather conditions. In the late 1970’s Bert Hansen developed a range of polyethylene (alkathene) easy to use “cold fit pipe fittings”. Back then this changed the way Kiwi farmers joined pipes together. Today Hansen Products continues to develop & manufacture a range of pipe fittings based on that original 70’s design. Hansen Poly Fittings are suitable for use above or below ground, in varying operating pressures and temperatures. They are Strong, Lightweight and Compact and are available in a variety of thread combinations and connections. 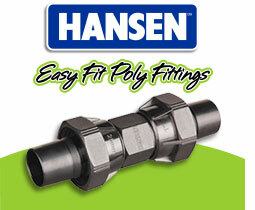 Wondering which Hansen Easy Fit Pipe Fitting will fit your pipe? Wonder no more! The Hansen Han-Tool is a simple effective tool used to determine which Easy Fit Poly or Compression fitting will fit your pipe. No more cutting off pieces of pipe and taking them to the store! 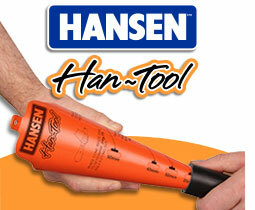 The Hansen Han-Tool takes the guess work out of it and tells you exactly which size and type fitting to choose.